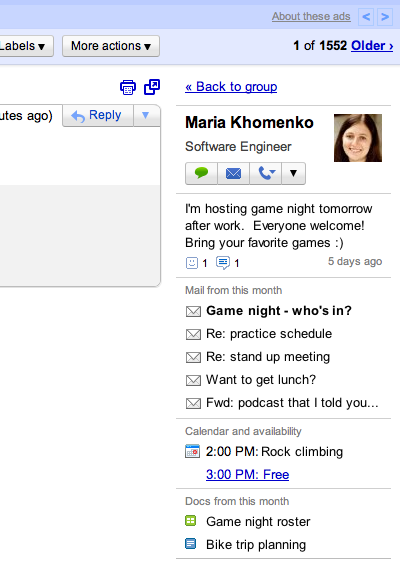 Google just announced the People-Widget in Gmail. Looks like another step into the Google social network. © by Google. All rights reserved. Look, I know some of you just don't care about email anymore. But this is where Google sees their central. And why not. Google Buzz is tightly integrated already, now we need some real personal tools to track your friends actions and communicate even easier in a more direct way. That's part of the Facebook-magic. Now this is a step toward the better interactions. It still seems to need some work, but it's the right way. And now, Google needs games to be integrated in their social ring. Love it or hate it, it's the engine of success, and what can be more social to play games together?